Supermarket, Shopping mall. It is just like “Okinawa Walmart”. 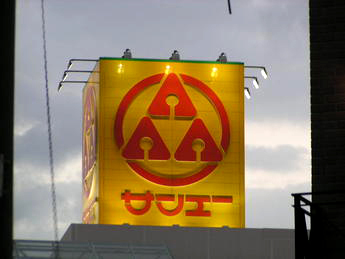 San-A has one of the best sales amount and the number of stores in Okinawa and also managing hotels and restaurants. The loyalty point card was first introduced for the first time in the same industry in Okinawa(1998) It’s founded in 1950 by Orita Kisaku in Miyako island. A period of obon and New Years, the store is crowded with customers. Some okinawan people say they only shop at San-A store, and is one of the most loved companies in Okinawa.